Although the deconstruction of modern technology was a key principle of the earliest, experimental forms of industrial music, its distinctive combination of analogue electronics, musique concrete sound pallet, and punk DIY aesthetic was gradually replaced with digital instruments, software, and pop sensibilities that facilitated the mutation of the genre from genuine art movement to “edgy” dance music. 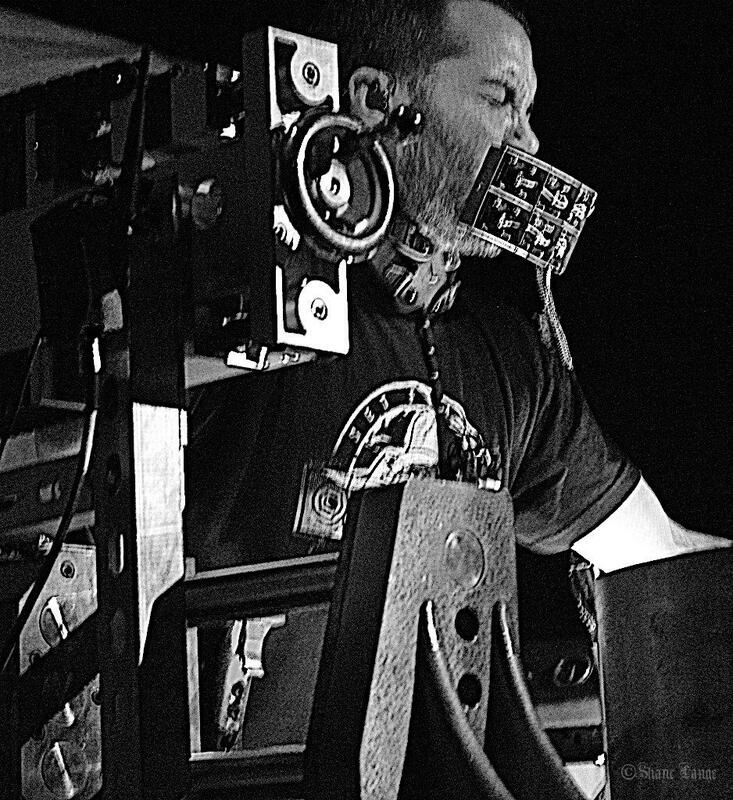 The future of industrial, then, may lie in the hands of artists like Tristan Shone, the one-man industrial doom outfit known as Author & Punisher, who both embraces and subverts the original spirit of industrial to construct his own customized machinery for musical expression. On Melk en Honing (Dutch for “milk and honey”), his fifth full-length album and first release for Phil Anselmo’s Housecore Records imprint, all of the familiar elements of Shone’s work – distorted drones and bass pulses, lumbering tempos, and throbbing mechanical percussion – coalesce in their strongest configurations to date, evidently informed by general anxiety about humanity’s precarious future and a palpable contempt for the complacent cultural self-interest hastening our demise. Tristan Shone (Author & Punisher) at The Hindenburg, Vancouver 11 December 2014. Unlike other musical visions of disaster and aftermath (for instance, Steve Von Till’s pastoral-gothic masterwork, A Life Unto Itself), Shone’s version of apocalypse is one of ongoing atrophy – the sound of chaos in slow motion, like the inches-at-a-time crawl of every gridlocked car idling through rush hour – which imbues the listener with a claustrophobic, paranoid awareness of civilization as a prison and technology/machinery form the bars of one’s cage. Beginning with the ominous beat and haunting vocal melody of “The Barge”, one has the impression of rowers toiling hopelessly on a slaver galley, trapped in an antiquated machine for which they are the engine. The torpid bass drone on “Cauterize” evokes nature’s indifference to human distress (“I’m not looking for madness, but it’s found”), and the harmonizing chorus amidst the crushing beats and drones on “Shame” sings an elegy for human frailty, subsequently echoed by the anthemic despair of “Future Man” (“Too little, much too late / given how far we’ve fallen”.) The revving drone and processional drum accompaniment on “Disparate” calls to mind surreal, apocalyptic imagery, like the literal mouth of Hell seen in medieval paintings and woodcuts, or Salvador Dali’s ponderous beasts in The Temptation of St. Anthony – an allusion further supported by the lyric, “strung out in the desert, no where and no sound” – and the presence of synth sounds – the buzzing, Menace Ruine-esque keys and death-knell piano – are appropriately dark and intense. Offering a respite from the preceding tracks, the stomping beat and granular concrete rhythm of “Callous and Hoof” is followed by the easy, Godflesh-y groove-and-drone of “Teething”. All of the searing, white-hot anger and raging despair culminates in a frantic acceptance on “Void, Null, Alive” (“for real, this condition”,) before transforming into an existential dirge that carves for humanity an epitaph in the auditory sludge. While the word “electronic” has repeatedly appeared in reviews of the album, one would argue that use of the term is misleading – digital electronics clearly help to generate or process certain sounds, but the overall sonic effect is more akin to subgenres of metal, power electronics, and noise than anything to which the term more commonly refers. And, as noted in interviews, the additional feedback from Anselmo in the role of producer seems to have helped Shone to refine his sound and practice to its current, utterly brutal and unflinching incarnation. Melk en Honing is “the sound of inevitability”, the sound of impending doom, slouching towards us all.